With My Dolphin, play with dolphins in your own home! The first ever therapeutic, action-based dolphin game! You are a dolphin trainer. Use the magical stick (Wii Remote and Nunchuk controllers) to perform in lifelike dolphin shows. Teach your dolphin tricks, and have fun watching your dolphin swim and play elegantly with different scenes, music, and angles. This game lets you train your dolphin, compete in dolphin shows, and watch your dolphin swim freely. 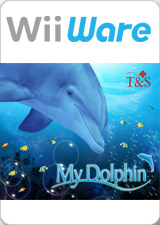 Using Nintendo Wi-Fi Connection Pay & Play, you can become friends with other dolphins that have different colors and personalities, as well as buy new toys such as rings and balls for your dolphin to play with. The graph below charts the compatibility with My Dolphin since Dolphin's 2.0 release, listing revisions only where a compatibility change occurred. This page was last edited on 19 January 2018, at 09:40.